The great artists of science fiction have always possessed a pretty impressive capacity to dream about the world that we *could* live in. While they may not have proved to be terribly accurate about the timing of these technological developments, it is usually safe to say that if you saw it on the television, internet, or in a magazine, it will eventually become at least a theoretical application for a real scientific hypothesis. One of the ideas that we have seen become a viable scientific theory is wormholes, although they are seldom called such. Let’s take a look at the feasibility of the Star Trek wormhole. For all the Star Trek 2009 fans out there, the idea of a wormhole is not very new. The concept is simple: wormhole α is in London while wormhole β is in New York; when you walk into α, you come out at β. Candidly, this idea of travel would be extremely useful for everyone in an innumerable number of ways (it would save time, lower gas prices, largely end our dependence of fossil fuels, provide new travel opportunities, make space exploration more cost efficient etc. ), But is it even scientifically possible to achieve? Preliminary data suggests that it just might be. Of course, in order for a wormhole to be a viable concept, there needs to be a legitimate scientific theory behind it. An Einstein-Rosen Bridge is a theoretical model for how such a portal would work. The bridge is split into two categories: a Schwarzschild Metric and a Traversable Model; however, as this is essentially an analysis of the viability of the wormhole as seen in the Star Trek movie, we will only focus on the Schwarzschild Metric type. A Schwarzschild metric is essentially an everlasting black hole with an interior white hole as its core. The idea is centered around how particles work when falling in an arbitrary geodesic in spacetime (a geodesic refers to a straight line’s curvature by spacetime in Einstein’s general relativity): if we know the particle’s geodesic trajectory, we can extrapolate its position at any time interval regardless of if it has reached that position or not. 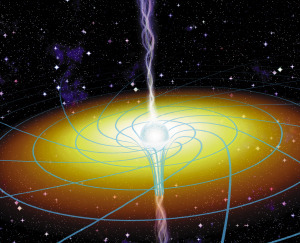 When such a particle interacts with a gravitational singularity at the center of a black hole, it is usually game over for the particle; however, when it hits a Schwarzschild metric, because of the white hole core, the particle’s geodesic would appear to be moving away from the event horizon. Because of this property of white holes, the black hole itself would also be ‘reflected’, thereby forming two parallel black holes and effectively linking two ‘parallel universes’, α & β. Therefore, When an observer in α observes particles around the singularity, these particles will have actually originated in β. If we place Spock and the Romulans in this scenario, we find that they would have originated in β universe and entered the parallel α universe, allowing the rest of the story to take hold. Isn’t science fun?